HTC EVO 3D is still lagging a bit behind the Optimus 3D from LG as there are fewer games available for it, and we’ll have to wait and see if they will quickly pick up the pace, especially since Samsung is expected to soon join the race for 3D-capable smartphones as well. 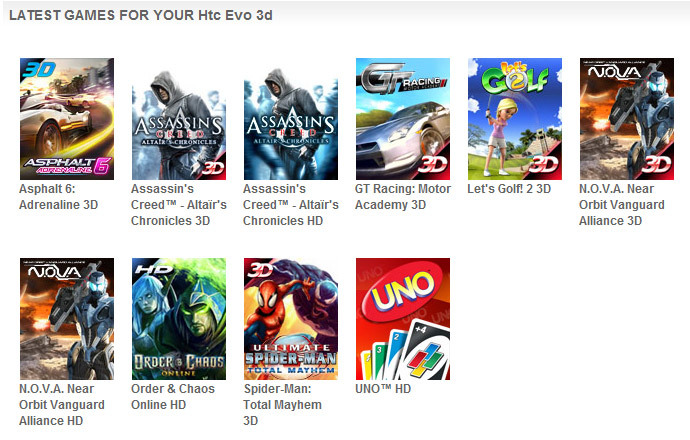 At the moment Gameloft has a total of six stereoscopic 3D games for the HTC Evo 3D smartphone, these are: Asphalt 6: Adrenaline 3D, Assassin’s Creed – Altaïr’s Chronicles 3D, GT Racing: Motor Academy 3D, Let’s Golf! 2 3D, N.O.V.A. Near Orbit Vanguard Alliance 3D, Spider-Man: Total Mayhem 3D. Furthermore you can also find Angry Bots 3D for HTC Evo 3D on the Android Market, available as a free demo and only for the HTC as it requires Android 2.3.3. 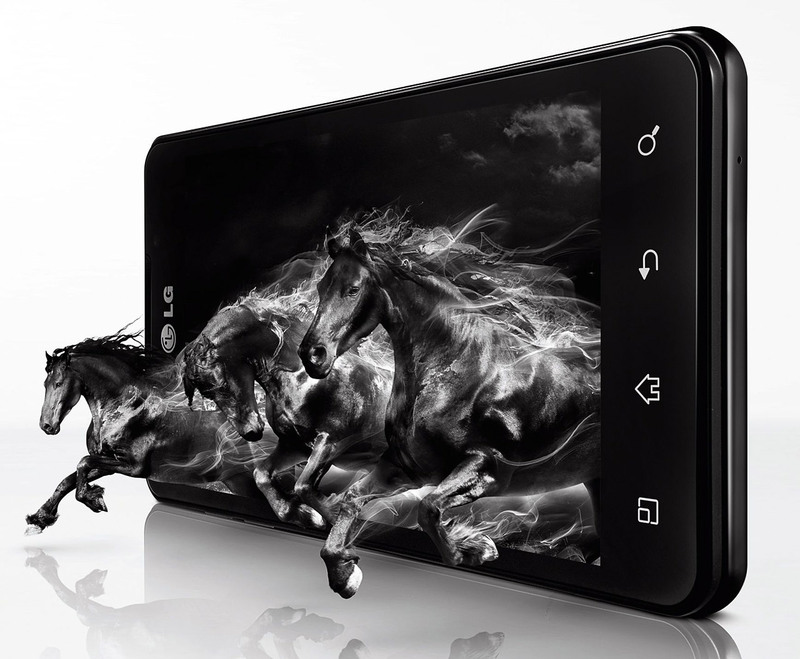 As I’ve mentioned LG is a bit ahead with 3D-capable applications for the Optimus 3D smartphone, but they have a bit strange policy in distributing the apps through different places. Gameloft has the most 3D games in one place, but even some of their titles are only available through the LG World’s 3D Zone (for some regions) and I couldn’t easily find any game on the Android Market that supports the phone’s 3D display. 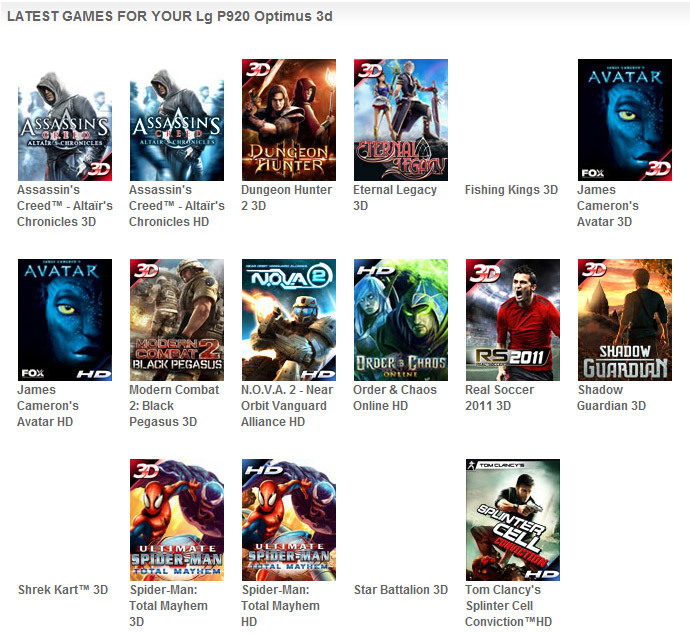 The 3D games that the LG Optimus 3D P920 smartphone currently has available (maybe not in all regions) on Gameloft’s site are 11 in total and these are: Assassin’s Creed – Altaïr’s Chronicles 3D, Dungeon Hunter 2 3D, Eternal Legacy 3D, Fishing Kings 3D, James Cameron’s Avatar 3D, Modern Combat 2: Black Pegasus 3D, Real Soccer 2011 3D, Shadow Guardian 3D, Shrek Kart 3D, Spider-Man: Total Mayhem 3D, Star Battalion 3D. That is of course on top of the few 3D titles you get preloaded on the phone. Furthermore you can find the free Archercraft S3D game on LG World’s website as well as some of the Gameloft’s games that you can also get from Gameloft directly. As per some requests I made some stereoscopic 3D screenshots from a mobile stereo 3D game and more specifically the game Asphalt 6: Adrenaline 3D by Gameloft on the LG Optimus 3D smartphone. 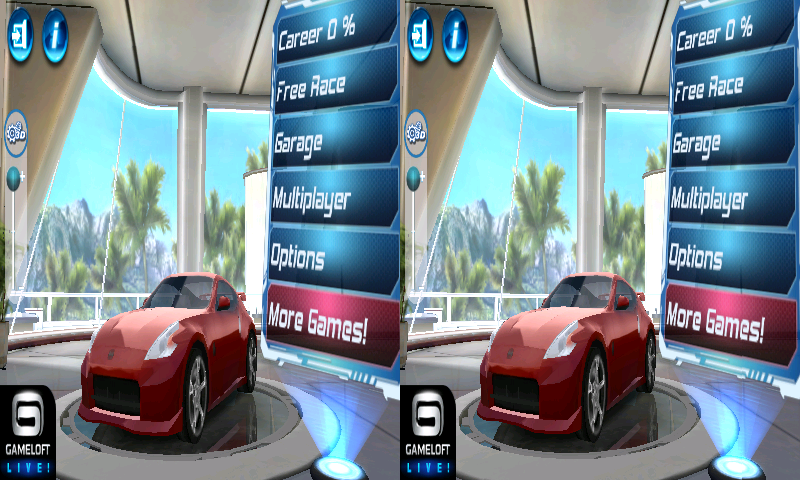 The screenshots are with three different 3D volume levels – minimum, medium and maximum as all of Gameloft’s stereoscopic 3D games have a slider for user control of the three-dimensional depth. Click on the image to see the full resolution Side by Side pair, the screenshots are with half horizontal resolution (squashed). The first 3D screenshot with minimum depth you see above is making the game pretty much look the same as in 2D mode, so instead of minimal depth you better switch to 2D mode and enjoy the game in full resolution. For taking the screenshots on the LG Optimus 3D smartphone I’ve used the free Android application called ShootMe that worked pretty well and was able to capture stereoscopic 3D screenshots without serious issues, although not all went perfect with all screenshots. The above 3D screenshot is with the default medium 3D depth level that is supposed to work well for most people, even if they are new to mobile stereo 3D gaming. The third screenshot is with the maximum 3D depth level and it provides stronger feeling of volume, so you should not start with it generally if you are new to stereo 3D as you may get tired quickly, get dizzy or a headache. I have taken a few more screenshots from the games bundled with the LG Optimus 3D smartphone – Asphalt 6 3D, Let’s Golf! 2 3D and NOVA 3D, you will can download them from the link below. As you will notice due to the reduced horizontal resolution in stereo 3D mode the straight lines inside games and the sharpness of details may not be great when you are looking at the screenshots on your PC, but they do look much better on the autostereoscopic 3D screen of a 3D-capable mobile phone.